We live in a time where rapid change is pretty much the only certainty, but one thing that continues to rather stubbornly maintain the status quo is our energy mix. 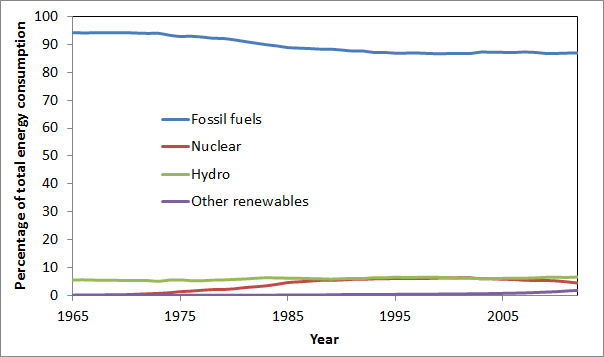 As shown below, fossil fuels still completely dominate global energy consumption and, since the nuclear boom ended a little more than two decades ago, those dirty old fossils have doggedly hung on to a roughly 87% share. This persistent fossil fuel dominance is especially remarkable considering the incredible amount of hype surrounding alternative energy sources, the two decades over which climate change has been a topic of intense international debate and the sharp hike in fossil fuel prices just after the turn of the century (below). This article will take a closer look at four reasons behind this surprising lack of change. When viewed collectively, the three major fossil fuels (coal, oil and natural gas) are pretty much the perfect energy source. These fuels offer highly concentrated chemical energy neatly stored in solid, liquid and gaseous forms, making them highly applicable to any energy application you can think of – electricity, transport, industrial heat or residential/commercial heating. They are available on demand, easily transportable, easy to utilize, highly concentrated and readily available in all three states of matter. What more can you want from an energy source? All we had to do to put this perfectly practical energy source to work was to dig it out of the ground and burn it. And that is exactly what we did. 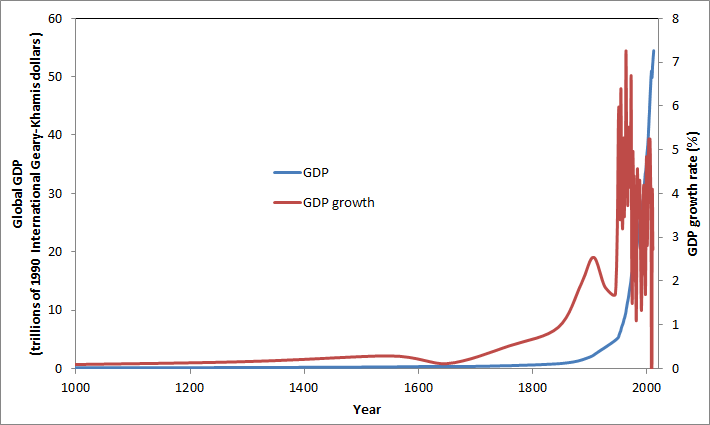 Since the second industrial revolution got going 150 years ago, fossil fuels drove the global economy to expand by a staggering 5000% (below). In those good old days, people generally consumed only as much energy as their own labour could provide. Nowadays, Americans consume energy at a rate of roughly 10 kW which is roughly equivalent to 500 manual labourers working 40 hour weeks for every man, woman and child. Just think about it: fossil fuels have granted hundreds of millions of people hundreds of diligent and versatile slaves to bring them food from every corner of the planet, transport them great distances over smooth highways every day and dutifully run their enormous homes and the masses of miscellaneous stuff they contain. If fossil fuels were not so perfectly practical and versatile, this would simply not have been possible. Since fossil energy is very easy to utilize, one does not need very complicated or expensive capital to get going. 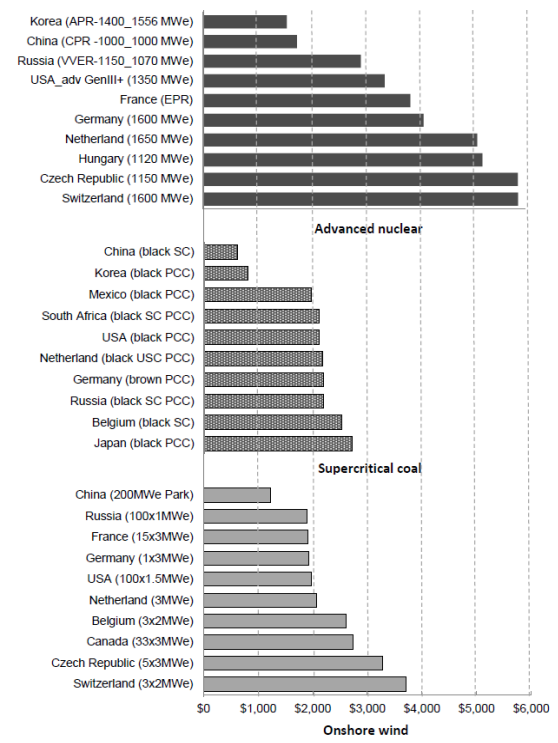 For example, China can build one kW of coal power for about half the cost of a kW of wind and a third the cost of a kW of nuclear (below). In addition, nuclear requires more specialized expertise and regulation than coal while wind energy is intermittent and typically operates at a capacity factor which is roughly 3 times less than that of a coal plant. So imagine for a moment that you are the king of a rapidly growing developing nation. You have worked long and hard to establish a favourable business environment and now have millions of people flocking to urban centres willing to work at wage levels that will undercut almost all international competition. All you need to release the enormous productive potential of your people on the world is energy – lots and lots of it. So let’s say you have $10 billion to spend on power infrastructure, what would you build? 6 GW of nuclear which is constantly haunted by the ghost of Fukushima, 8 GW of wind which will give the same output as 2 GW of nuclear (only in random intermittent bursts), or 16 GW of simple and practical coal? Any king who would like to keep his crown would not even think twice about choosing the coal. For the same $10 billion upfront investment, he can get nearly triple the amount of growth-driving electricity as nuclear (probably in substantially less time) and 7 times as much growth-driving electricity as intermittent wind. Yes, the coal capacity will have substantial fuel costs that the nuclear and wind capacity do not have, but these fuel costs will be paid over the lifetime of the plant and will be compensated for many times over by the resulting economic growth. The same is true for cheap and simple internal combustion engine cars and cheap and simple industrial heat. The fact that the utilization of fossil fuels is so easy and practical just gives it an enormous advantage over alternatives when economic growth is a priority. 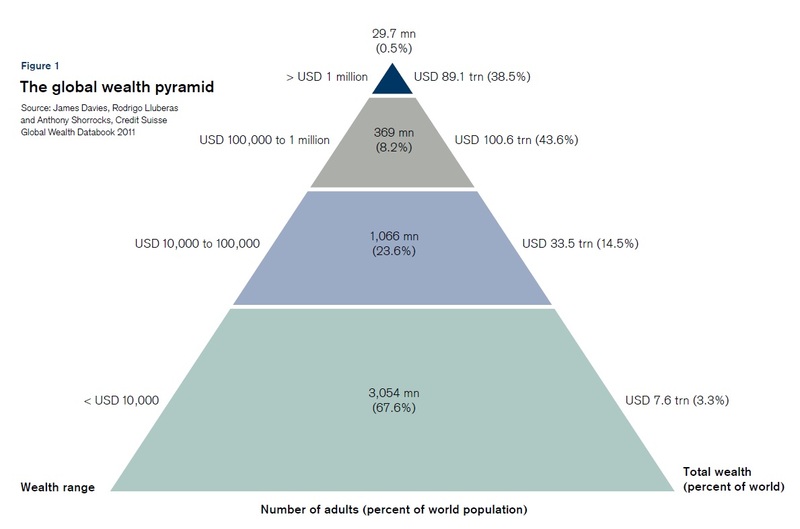 Naturally, much of this fossil fuel advantage evaporates when growth no longer is a priority, but the 80+% of world citizens living in the developing world are still many decades away from reaching this stage. According to Wikipedia, “a cash cow is a product or a business unit that generates unusually high profit margins” – a definition that applies very well to fossil fuels. While it is true that the average cost of extracting fossil fuels is slowly rising, the meteoric rise in market prices since the turn of the century has made the fossil fuel industry immensely profitable. This is illustrated for oil in the figure below. 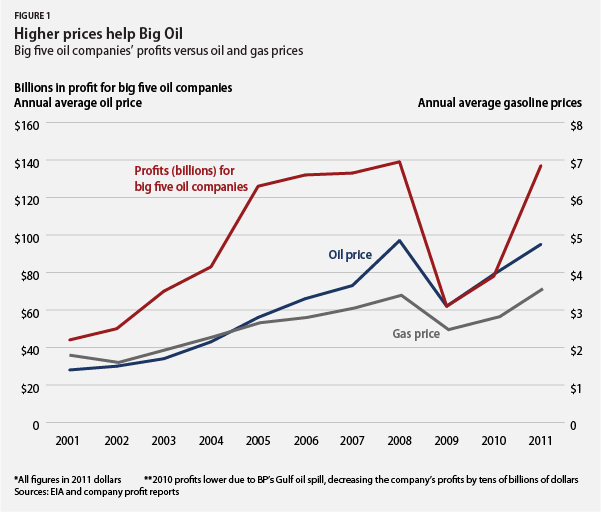 The obviously high correlation between the oil price and profits to oil companies is clearly visible. Not only do these windfall profits pay very handsome dividends to private investors, they also deliver handsome tax revenues to governments. Thus, it becomes clear that higher fossil fuel prices will only serve to entrench the fossil fuel industry even further by increasing the profit margin on every barrel, ton or cubic meter of fuel extracted from the earth. As shown below, the world still has technically recoverable oil reserves that can be extracted for less (often a lot less) than $100/barrel for almost 200 years of present day consumption rates. 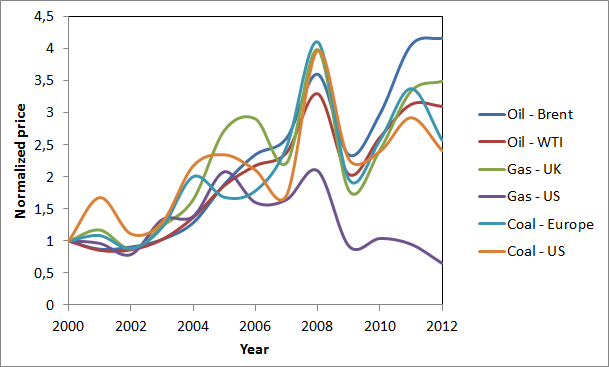 Even if we eventually manage to impose a steady price on CO2, it will not make much of a change to this outlook. 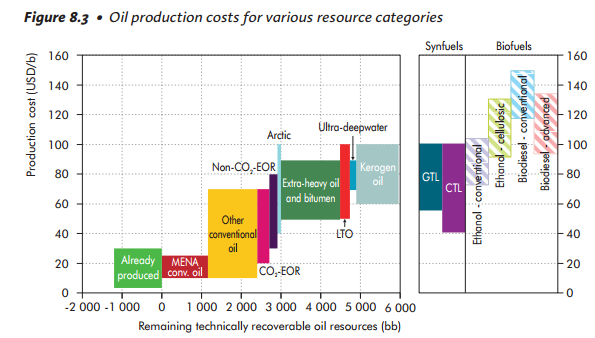 A CO2 price of $30/ton will add about $13/barrel to the cost of oil, still leaving very healthy profit margins for the majority of producers at current prices. Our entire modern civilization was built by fossil fuels for fossil fuels. We have built an enormous fleet of coal and gas-fired power stations, more than a billion oil-driven cars and a very impressive collection of fossil fuel-driven industries – each category consuming roughly a third of global fossil fuels. In addition, we have built an enormous fossil energy extraction and distribution network of mines, wells, pipelines, supertankers, filling stations and transmission lines which continuously keeps our societal foundation of fossil energy humming along. This enormous support base just screams the letters B, A and U, especially with persistent economic troubles still lingering from the great credit crisis of 2008 and showing no signs of going away. It is very important to understand that fossil fuels form the very foundation of our global civilization and that rebuilding this foundation without compromising the integrity of the structure as a whole will be enormously challenging. If such a fundamental remodelling is not done very slowly and carefully, our debt-based global economy with its enormous fiscal imbalances, unfunded welfare promises and social inequality (below) can implode with little prior warning. People often over-simplify the decarbonization of the global economy by predicting “disruptive change” as alternative energy costs continue downwards and fossil energy costs continue upwards. This disruptive transition has been predicted for decades now and, as shown in the first figure in this article, has thus far completely failed to materialize. Fossil fuels continue to dominate because dispatchable energy from coal/gas plants and gasoline filling stations is so much more practical than intermittent energy from wind and solar farms and the charging of EVs. Fossil fuels continue to dominate because the 6 billion people living in the developing world want rapid economic growth through highly scalable tried-and-tested methods with very low up-front costs. Fossil fuels continue to dominate because they are immensely profitable both to private investors and governments. Fossil fuels continue to dominate because they form the very foundation of our modern civilization. These are certainly some highly inconvenient truths, but these truths must be honestly acknowledged if our global civilization is to have any chance of recovering peacefully from our current position of large and growing ecological overshoot. Establishing the objective reality must be the first step towards solving any complex problem and the global sustainability crisis of the 21st century is no different. In this case, the objective reality is that fossil fuels will most probably provide the majority of global energy for many decades into the future. Unless we see some truly gamechanging technological breakthroughs in nuclear and/or renewable energy, the vast majority of economically recoverable fossil fuels will be burnt. Unrealistic demands that we leave all of that perfectly practical potential energy in the ground can serve only to perpetuate political gridlock and exacerbate current adverse economic conditions, thereby doing nothing more than further entrenching the fossil fuel status quo. Completely agree, even if a little pessimistic sounding of our odds.